JCPenney offers one of the best selections of high quality, long lasting, affordable menswear you'll find. We have men's dress shirts to fit all shapes and sizes as well as men's ties to go with them, providing you a one-stop shopping experience to save you time. After all, we know you're busy, so we make it easy to find exactly what you're looking for. Whether you need a dress shirt for a special occasion or every day at the office, you'll find what you need here. We feature a broad selection of styles, including regular, fitted, slim, and athletic fit dress shirts in a variety of fabrics to make sure you're comfortable all day. Peruse the selection of button-up shirts, button-down collars, and tuxedo shirts to find exactly what you need. Dress shirts are a staple for today's man. Wear them with suits for work or special occasions – or roll up the sleeves and wear them untucked with jeans for a more casual day of hanging out with your buddies or going on a date. It's all about embracing your personal style for a look that is all yours. When it's time to get decked out in formal attire, the tuxedo shirts will take you to a whole new level of style. Do you like the breathability of cotton? We have you covered with all-cotton shirts as well as some with a wash-and-wear cotton blend. You'll also find shirts with stretch and some with extra long sleeves to ensure the perfect fit. We provide a variety of shirts with easy-care and stain-resistant fabrics to make your life easier. It's also important to choose the right fabric for your personal comfort. Select broadcloth or poplin – both lightweight fabrics – for warmer weather or layering. Oxford and pinpoint fabrics are ideal for cooler climates. JCPenney offers quite a few color options of dress shirts for men with a full spectrum of hues and patterns to choose from. You'll want to have the basic white shirts, navy shirts, and gray shirts, but you should also consider adding stripes, checks, and some of our other fabulous prints that will add an extra layer of style and a bit more zing to your outfit. A well-dressed man does not live by nice shirts alone. 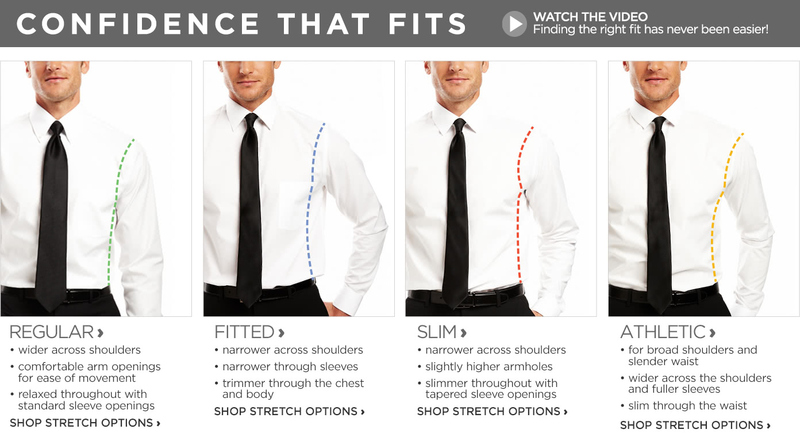 JCPenney offers an assortment of dress ties as well as more casual options. Do you prefer a classic burgundy tie with a simple design, or are you the daring type to wear bright colors and bold patterns? We offer solid, paisley, striped, floral, and more, so you'll have loads of ties to choose from here. Are you more of a necktie or bowtie kind of guy? We have both. You'll find plenty of ties to choose from at JCPenney. Regardless of your style, size, or color preferences, JCPenney offers high-quality dress shirts for an affordable price, so you can look good without worrying about budget restrictions. This gives you the opportunity to take your mind off the price and focus on the things that really matter, like fit, comfort, style, and looking your very best.